As an industry analyst, I spend much of my time doing vendor briefings, where the vendors update me about their products, strategy, direction, sales wins, etc. I recently had briefings with some vendors that are not as well known in our industry as some of their larger counterparts, but have interesting stories to tell. When I was preparing a presentation on “The Future of Collaboration,” I researched some companies providing interesting visual collaboration offerings, and came across Nureva. 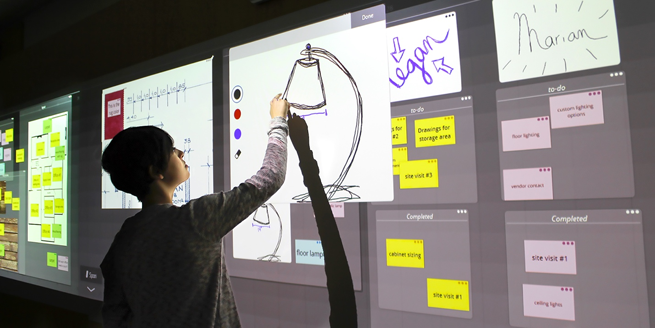 Nureva Span is a cloud-based system that takes paper tools such as sticky notes and pencil sketches and transforms them into digital versions to create an interactive digital wall, transforming a wall into a digital workspace. It uses one or more short-span projectors to create a virtual canvas (up to 200’ wide with 40 simultaneous touch points) that is projected onto a wall and accessible from personal devices. I spoke with Nancy Knowlton, Nureva’s co-founder and CEO (she and her husband David Martin also co-founded SMART Technologies) about what makes Nureva Span different from some of the other solutions out there today. She explained that when they founded Nureva, they spent a lot of time understanding what business people do when they get together to collaborate. According to Knowlton, “Much of what people do is one way presentations, but that’s not real collaboration. It should be about how my perspective adds to your perspective.” Collaboration typically involves an analog process with sticky notes and flip charts on a wall Information, but this is difficult to manage, store, and share, and is ineffective for remote contribution. Knowlton explained, “As you contemplate new concepts and ideas, you can put ideas on the wall and put them together. As we thought about the analog sticky note process, we realized there’s importance of bigness of space. We can put multiples of systems together around a large workspace so we can view up to 80’, and it becomes an immersive display.” Users can contribute from PCs and tablets, with all the information saved in a persistent collaboration space in the cloud. This is truly a different way to collaborate. Another company I spoke with is Unified Office. I met CEO Ray Pasquale several years ago and recently got an update on the company and the tremendous progress it’s been making. Unified Office is a managed services provider offering hybrid cloud-based virtual communications services and business analytics. The fully managed business services for SMBs is based on its flagship Total Connect Now service architecture. For example, restaurant owners can leverage the analytics and information provided by Unified Office’s Total Connect Now and Visual Performance Suite (VPS) managed communications service, getting more visibility into their business operations and service performance metrics. Pasquale told me that one pizza restaurant found that its revenues increased 30%, thanks to Unified Office’s analytics tools that let the business see its activity in real time and make changes as needed. More than 50% of pizza revenue comes in through communications. Unified Office has been moving into the IoT world, and found many interesting use cases, especially for its restaurant customers. For example, sensors for thermostat controls can report back to Unified Office software if the refrigeration temperatures get out of compliance, and send alerts to managers, while providing an audit trail for restaurant inspectors. This also helps the restaurants do preventive maintenance and avoid potential problems. The company recently announced that its managed service customer, Bay Microsystems, “attained dramatic productivity growth” from its deployment of Unified Office’s Total Connect Now VoIP and analytics business communications platform. I’m looking forward to seeing the progress Unified Office makes, especially in IoT, which is an area that has great potential. Sennheiser has been expanding beyond the contact center to the enterprise for the past few years, and has recently made a move to address the latest trend of dynamic collaborative workplaces. Building on its SP10 personal speaker phone for small offices and huddle rooms, the new SP 220 is a portable, dual speakerphone solution that fills the demand for larger conference rooms serving 12-16 people. The SP 220 was made to address a variety of situations, including ad hoc meetings and times when dedicated conferencing facilities aren’t available. The device competes with traditional conference speakerphones, but according to Bowersox is more portable, doesn't require power, and simply plugs into a USB port. The SP 220 also has an interesting design. It’s essentially two SP20s that connect together and work together seamlessly. You can use a single puck for regular conference calls in small rooms, but if you need more coverage (beyond 6-8 people), you can add the additional puck and use it for 10-16 people. Each unit provides “omnicoverage” (circular coverage) for about five feet for a single unit, or 10 feet for both units. 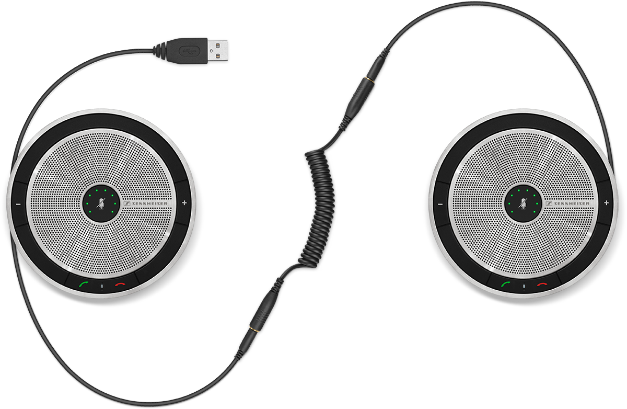 The system provides echo cancellation and based on my experience with it, provides excellent sound quality. The device is plug and play, and doesn’t require pairing devices. Bowersox states, “You just plug it into a computer and it’s good to go.” The SP 220 is certified for Skype for Business and most other UC systems, including Cisco, Avaya, and ShoreTel systems. With the SP 220, Sennheiser now has a more complete offering for conference rooms, and enables the company to expand to a variety of conference settings. While I don’t always have a chance to write about my many (often too many!) vendor briefings, it’s nice to be able to share this information and give readers a taste of some of the new and exciting stuff out there.